Help me identify this pattern, please! Thread: Help me identify this pattern, please! I am a new quilter, even at 65 or is it 66!! Even so, my sister has had these quilt squares (30 of them) in a cedar chest of our Grandmother. There were 2 different patterns, the first I know as Sunbonnet Sue but have not a clue what this pattern is. I am new to the forum and hopefully I can get the picture on here. Would appreciate any help as to name of pattern and possibly when it was popular. We are thinking early 40s. Also, how would you quilt them?? What color sashing, etc? Thinking vintage material with a small flower and different colors, but am definitely open to suggestions!! What a treasure to have. I don't know the pattern name, other than adorable! I would sash them with reproduction 30's prints. Very cute! I don't know how old the pattern is, my DM made it for my DD in 1982. She called it the cuipee doll quilt, don't know if that is the right name. It is a very cute quilt. I had about 85 of these 1/2 boys and 1/2 girls. The embroidery was not done but the applique is excellent. I modified the facial features and put the girls together with strips of reproduction fabric for the period which is probably 1935 or newer I think. I added some more detail to make a sleeve show up. I just assumed it was another version of Sunbonnet Sue. Yet another work in progress. Thanks for all the info! 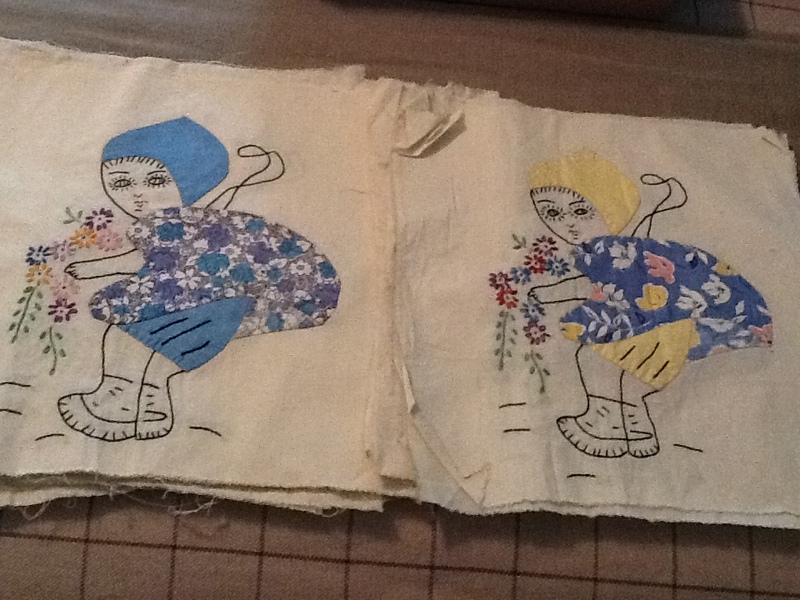 I am afraid it will take me forever to get it quilted but I am going to do my best to finish this and the Sunbonnet Sue as quickly as possible. Funny, it's been in a cedar chest for 50+ years and now I want it quilted today!! Oh darn-I was hoping that someone had more history on this block. My LAQ had blocks, added sashes and quilted-turned out really cute. Then another friend has about 20 of these-but whoever did them, appliqued the shoes and the flowing scarf. They are really cute blocks and everyone I have seen, the embroidered face has been different. My Grandmother called this the Dutch Doll. She made this quilt for me when I was born in '37. Thanks so much for the responses. Cherylsea, I went to the website and this looks exactly like the blocks. However, the eyes on the ones I have are scary looking (the reason my sister and I were calling it Scary Girl--LOL)!! The eyes are really pretty on the one at the free-quilting website. Thank you so much for the info. When I read about it I saw it was done in 1916, the year our DM was born. So maybe that means our DGM was pregnant with our mother when she completed the blocks. Since we don't know the history, that sounds like a perfect story to go with. Can we make our own history that way?? I am new to this so I am hoping I am using the right abbreviations! Thanks again for all the information. I am so excited to have something to say on my quilt label!! OH wow Oh wow. What a find. I was also thinking Hummels but would go with the Dutch Girl. I mean being Dutch and all. Thanks for posting the link. I have a few grand daughters that could use this pattern . Adorable. It's wonderful to know that it originated almost a hundred years ago. Similar styles of embroidery and applique designs continued to be popular for many years. It reminds me of the iron-on patterns from my mom's Workbasket magazines in the 1950's, but I've never seen one exactly like it. I look forward to seeing the finished quilt. Wow, it's been around that long and I've never seen it. Much cuter than Sunbonnet Sue! I agree I would add some black embroidery to outline a sleeve.... You can buy authentic 30's fabrics, you don't have to use reproductions unless you just want to. Ebay and Etsy are good places to look. Search for "vintage feedsack fabric". You have a real treasure there. The embroidery work is awesome on it. Can't wait to see how you make it up. I have no idea what the name is, but they would make a fantastic quilt with sashing between the blocks. I agree with Cherylsea, it's Little Dutch Girl. I think the way the eyes look just depends on who did the embroidery. There are some at this link that have "scary eyes", too. my first thought was "little dutch girl" even without going to resources, just flashed from my memory.